"I have a vision of thousands of missionaries going into the mission field with hundreds of passages memorized from the BOOK OF MORMON so that they might feed the needs of a spiritually famished world." "Some have suffered death to make it possible for us to have the scriptures today. At times laws even prohibited the public or private reading of them. What a marvelous blessing we have to not only possess the most complete collection of scripture in history, but also to have the freedom to search and to use them!" "People as well as nations perish without scriptures. The scriptures are spiritual food for our spirit, which is just as important as physical food for our body." "If we're not reading the scriptures daily, our testimonies are growing thinner, our spirituality isn't increasing in depth." 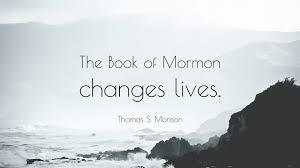 "Scriptures are Letters from Home. Can you imagine getting a letter from home and not even bothering to open it?" "Read scriptures daily. Your exact answer might not be in what you read that day, but the spirit is there—and in the spirit lies all answers."